24-Mar-2016 -- We have hiked on 40 days 1200 km on foot starting in Zurich, Switzerland to reach this confluence point. The start of this hike was back in January 2015, when we began our journey to Paris. We continued hiking to Le Havre, took a ferry to Portsmouth and kept on walking via London and Cambridge to the nearby village Barkway. The specialty of our trip is that hiking is not done in one go, but in stages. On average once every month, we hiked for the weekend and travelled back home to Zurich by train. When the next opportunity arose, we took a train to the place we had finished last time and resumed our hike from the same train station. A summary of the trip can be found here. We reached this confluence point on day #7 of our leg from Portsmouth to Peterborough. Normally, I am not interested in revisiting confluence points, but this one had undergone an unexpected change: the former agricultural field that I had visited back in 2004 had turned into a fenced compound of the solar energy company Push Energy. 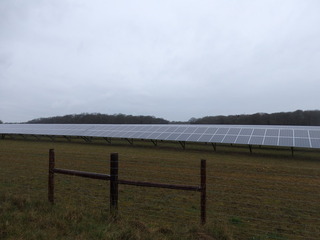 This particular project is called Wisbridge Solar Farm and consists of 36,624 solar modules with a capacity of 9.34 MW. More information can be found on the project website. For the confluence project however, it means that a huge area around the confluence has been covered with solar panels. Public access is now restricted to a minimum distance of 57 m. Right at the nearest point of public access, there is a “Bee Hotel, Home For Solitary Bees”. Since we were not feeling solitary, we decided not to stay in the bee hotel and continued our hike for another hour spending the night in a hotel in Royston. Two days later we returned from Peterborough to our home in Zurich.